Does Exfoliating Clean Your Pores? You can exoliate your skin with a brush or handheld vibrating exfoliator. Exfoliating is an essential part of a healthy skin care regimen, as it allows you to clear your skin of dead cells. Topical exfoliating products such as scrubs and peels work well on the face and help to clean oil and dirt from pores. For the rest of the body, physical exfoliators such as brushes or a loofah work well to slough off dead skin cells and can be used regularly in the shower. Exfoliating scrubs are cleansers applied directly to the skin, especially the face. They contain rough granules such as sugar or microbeads that work to clear away dead skin cells and clean pores. 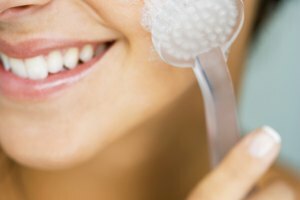 Chemical exfoliators are usually applied after washing your skin with a gentle cleanser. These products are usually in the form of toners or lotions that contain alpha hydroxy acids, which peel off dead skin and aid in the quick regrowth of new skin. For stronger chemical exfoliation, such as a peel, visit a salon or dermatologist's office. The simplest of physical exfoliators comes in the form of a soft-bristled hand-held brush, usually used for exfoliating the body rather than the face. Similar to the brush is the loofah, a dried natural sponge that contains rough fibers that help to slough off skin cells in the shower. For the face, hand-held, battery-powered exfoliators make use of a vibrating brush or pad to loosen and scrub away dead skin cells without being abrasive. They can be used with a gentle cleanser or facewash for a clean, smooth glow. Self: What's the Best Way to Exfoliate Yourself to Glowing Skin? Aiden Summer is a creative production consultant for artists, architects and designers. Are Facial Scrubs Bad for Your Skin? Summer, Aiden. "Exfoliating Methods." Synonym, https://classroom.synonym.com/exfoliating-methods-14539.html. Accessed 23 April 2019.